Since its beginning, Vietnam Veterans of America has been at the forefront of seeking answers about the effects of Agent Orange on veterans and their families and getting justice through treatment and compensation for illnesses caused by the military’s use of this defoliant. 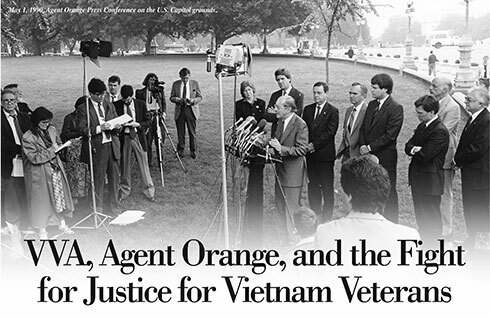 The very first witness at the first congressional hearing on Agent Orange in 1979 was then VVA Vice President John Terzano. One year earlier, the Veterans Administration had established an Agent Orange Registry offering veterans a physical examination, but it would not acknowledge that any of the illnesses they found had any link to Agent Orange exposure. A top VA clinician published an article, “Agent Orange and Witchcraft,” that concluded that Vietnam veterans were just using the issue to get compensation from the VA with no scientific evidence that Agent Orange had caused any illnesses. Also in 1979, veterans brought a class-action lawsuit against the chemical companies that had produced Agent Orange. The lawsuit was settled by the companies in 1984 for $180 million. The disabled, the seriously ill, and the survivors of Vietnam veterans were paid an average of $3,000 from this lawsuit. But the suit did not find significant evidence of harm to veterans from Agent Orange: The companies settled simply to stop the controversy. I first heard about Agent Orange when I joined Columbus, Ohio, Chapter 16 in 1981. We had lots of questions about the effects of Agent Orange on Vietnam veterans but few answers. At town fairs where we set up information booths, we explained that Agent Orange had been used as a defoliant to clear the jungle. The herbicides in Agent Orange were not the problem. It was dioxin, a byproduct of the manufacturing process, that was believed to cause illnesses in veterans. To make Agent Orange, chemicals were heated together. The higher the temperature, the faster the process. But that also results in a higher concentration of dioxin. The military needed lots of Agent Orange, and fast, so manufacturers used the highest possible temperatures in the production. At the time, I realized that we were going to need a lot of scientific studies to get the answers veterans wanted and needed. 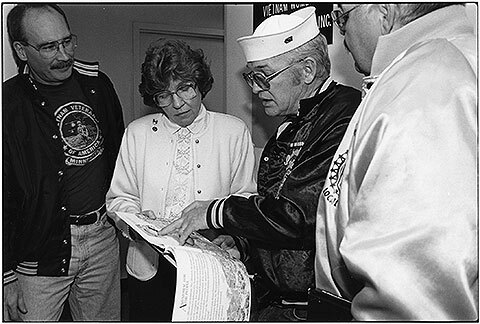 Information booths were a good way to let veterans know that VVA was working in their interest. The real impact of Agent Orange—and maybe my fervor to find the answers—came to me when I was working as Executive Director of the VVA Ohio State Council in 1982. A young woman called the office inquiring about the possibility of education benefits for veterans’ widows. Her husband had died of soft tissue sarcoma. The doctors who cared for him asked over and over what toxic chemicals he had been exposed to. They suggested that his illness may have been a result of exposure to chemicals in Vietnam. She had two young children and was looking for a way to get an education so she could support them. Sadly, there was nothing we could do, but I talked to her about making a claim for an Agent Orange-related illness. She understood that her claim would be rejected but also that it would be in the system if we ever were able to get recognition of illnesses related to Agent Orange exposure. She drove the thirty miles to Columbus, and I accompanied her to the VA office to put in her claim. The claims worker took the information but was very pessimistic about any chance of compensation. The second incident was a call from a woman whose husband had recently died from a severe heart attack just six weeks after participating in the Air Force’s Ranch Hand Study, which looked at the health status of the crews who flew Agent Orange spraying missions. She had been told by doctors that the blockage that had caused his heart attack could have been detected with a thorough physical examination. She questioned the validity of the Ranch Hand Study. As the years went on, many other people questioned this study, too. At one point, several of the Ohio State Council officers and I met with Dr. Barkley Shepherd, who was the head of VA’s Environmental Hazards Services. He briefed us on what VA was doing about Agent Orange concerns but related that the only illnesses he thought would ever be compensated were chloracne and porphyria curtana tarda. 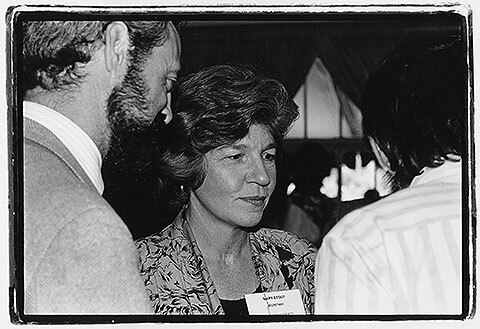 And so, at VVA’s first National Convention in 1983, Rep. G.V. (Sonny) Montgomery (D-Miss. ), the Chair of the House Veterans’ Affairs Committee, announced that those conditions would be determined to be service-connected. It seemed like we were making some progress, but it felt more like a bone to shut us up. For the next two years, little happened. There were lots of obstacles to this quest for justice for veterans. The VA was dragging its feet on a study mandated by H.R.1961, which had become law in 1983. There was little support from other veterans service organizations. Members of Congress wanted definitive proof that dioxin was the causative agent in any illnesses. And, perhaps most importantly, House Veterans’ Affairs Committee Chair Montgomery was steadfastly opposed. Montgomery was a World War II and Korean War veteran and a retired Major General in the Mississippi National Guard. As I got to know him, I determined that, while he was known as “Mr. Veteran,” his highest concern was always for the military. One of his greatest accomplishments was the Montgomery G.I. Bill, which gave education benefits to peacetime military personnel, including National Guard and Reserve members. It was a very successful recruiting tool for the all-volunteer force. The idea that the U.S. military had used chemicals that injured its own forces was not something he could support. As Chairman, he was very powerful. The understanding in Congress at the time was that if a bill got through the House Veterans’ Affairs Committee, it became law because Sonny Montgomery approved it. Going against Montgomery would be our biggest challenge. He also believed that “all politics is local,” reminding us of this at a hearing right after we had gotten the New York Times to run an article about his opposition to several Vietnam veterans’ issues. “The people in Meridian, Mississippi, don’t read the New York Times,” he told us. But VVA members were asking us how to get rid of him. At the time, we had no chapters in Mississippi, so we decided to send a reporter to Meridian to talk to people about their views of Montgomery. They loved him, and he loved the article, even though it was meant to explain to VVA members the difficulty we faced in replacing him. We did have support from members of the Vietnam Veterans in Congress caucus. Sen. John Kerry (D-Mass.) would add an important piece to the final legislation. In the House, Reps. David Bonior (D-Mich.), Tom Daschle (D-S.D. ), and Lane Evans (D-Ill.) and their staffs worked with us throughout the whole process. Their support never faltered. Another indispensable group in our work on Agent Orange was the National Veterans Legal Services Project (NVLSP), which was by then working with VVA on many projects. After I was elected VVA National Secretary in 1985, I got more involved in legislative issues than I had as the Membership Director, and the Agent Orange issue continued to bother me. We would talk about it but always felt stymied by the lack of progress. “You guys can’t give up on this” she retorted. “The EPA just bought out a whole town because of dioxin. There’s something very wrong with that stuff.” Angie was an epidemiologist with the Environmental Protection Agency. We knew about Times Beach, Missouri, but could not find a way to correlate that incident to veterans’ experiences. the New Jersey Agent Orange Commission, and Joe Bangert, the Executive Director of the Massachusetts Agent Orange Commission, to help. We met over a weekend and spent all day Saturday and much of Sunday reviewing what had been done, what the stumbling blocks were to getting meaningful legislation to help veterans, and where we needed to go next. Auletta explained how difficult it is to find that “silver bullet” correlation between chemicals and illnesses that Congress was demanding because you can’t test chemicals on people. What scientists look for is an increased risk of illnesses in exposed communities. There were already scientists looking at dioxin exposure, but VA discredited every study by questioning the methodology, the sample size, or anything else they could find to throw into doubt the scientific work. At the same time, however, they couldn’t work out a protocol for the legislatively mandated study. Eventually, the VA transferred the study to the Centers for Disease Control, which also never did the study. By the end of the weekend, we had the beginning of a new plan: We would propose legislation to have an independent scientific body review all dioxin-related studies and inform VA of their findings on a regular basis. Along with this, we needed to have VA rescind its regulation that only chloracne was related to Agent Orange exposure. NVLSP accomplished that by bringing the Nehmur class-action suit, which they won in 1986. We also needed to have a presumption that anyone who served in Vietnam had been exposed to Agent Orange. Then we started our work with members of the VVA Board to get their approval and with members of Congress to get legislation written and introduced. 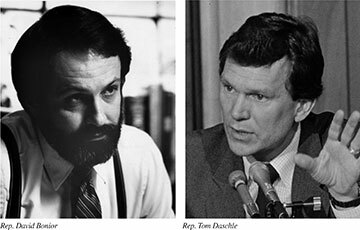 Rep. Tom Daschle and his staff took the lead in writing the legislation for the House of Representatives and John Kerry took on the task in the Senate. We felt the most important part of the legislation was the establishment of an independent scientific group to look at all the studies. It could not be the VA or any other government agency. Sen. Kerry convinced us that we had to ask for the most credible group, which was the National Academy of Sciences. He argued that it was the only group Congress would recognize as fully credible. We reluctantly agreed. It took four years of work with the VVA Agent Orange Committee, the VVA Board, members of Congress, VVA Legislative Coordinators, State Councils, and Chapters to finally have a chance to get the legislation before the House Veterans’ Affairs Committee. During that time, there were numerous hearings in both the House and Senate Veterans’ Affairs Committees. We tried to get the committees to allow testimony from scientists working in the field, but those requests were most often denied. We also brought new attention to the issue and new supporters to join us. In 1986, a TV movie, Unnatural Causes, starring John Ritter and Alfie Woodard, presented the plight of a Vietnam veteran dying of cancer and his VA advocate fighting to get compensation for his illness. We worked with Adm. Elmo Zumwalt, who had been the Commander of Naval Forces in Vietnam from 1968 to 1970, when he was appointed Chief of Naval Operations by President Richard Nixon. His eldest son, Elmo Zumwalt III, a Vietnam veteran, was diagnosed with lymphoma in 1983 and Hodgkin’s disease in 1985. In a 1986 article in the New York Times, Zumwalt III wrote: “I am a lawyer and I don’t think I could prove in court, by the weight of the existing scientific evidence, that Agent Orange is the cause of all the medical problems—nervous disorders, cancer, and skin problems—reported by Vietnam veterans, or of their children’s severe birth defects. But I am convinced that it is.” He died two years later. After I was elected VVA National President in 1987, I did many interviews for radio, TV, and print media. The press was interested in the first woman elected to head a veterans service organization, so I had lots of opportunities to talk about Agent Orange and the issues facing Vietnam veterans. It is important to note that throughout these years there was little support for Agent Orange legislation from the other VSOs. They followed the VA and Congress’ line that there was no connection between Agent Orange and Vietnam veterans’ illnesses. The Veterans Administration had taken a very hard stand even against being asked questions by veterans about Agent Orange. We heard from many members that their VA doctors would not even discuss the possibility that some of the illnesses they had could be associated with this exposure. Years later, some VA doctors told me they had been specifically ordered not to discuss it. As we got closer to the possibility of getting meaningful Agent Orange legislation, the VA took harder lines. At one Senate hearing, VA Deputy Administrator Tom Harvey, a Vietnam veteran, displayed the Ranch Hand flight maps and pointed out where he had served and probably been exposed. But, he noted, neither he nor any other Vietnam veterans working at the VA had any health problems. He then went on to introduce his wife and two-year-old son and said he understood Vietnam veterans were concerned about possible effects on their children. He, like them, worried about his son. He failed to point out that his son was adopted. When President George H.W. Bush was elected, things changed at the VA. President Bush nominated Ed Derwinski to be the first Secretary of Veterans Affairs. My first meeting with the Secretary was a roundtable discussion with a large group of veteran advocates. Derwinski was interested in our concerns. Adm. Zumwalt was at that meeting and raised the Agent Orange issue. While the other major veterans’ organizations were silent, I was able to add to the Admiral’s concern. Shortly after he was confirmed, Derwinski invited me and Paul Egan, VVA’s Legislative Director, to a private meeting. He wanted to discuss our top issues. While they differed from his, we came to an agreement to try not to surprise each other. For our part, we went to Derwinski several times about concerns with regulations with which we disagreed. We could have gone to the press and looked like heroes at VA’s expense, but our concern was for veterans. Derwinski listened to us and, on one occasion, called in the head of the Veterans Benefits Administration and had a regulation immediately rescinded. Then one day in the summer of 1990, he called me to tell me he was having a press conference to announce that soft tissue sarcoma and Hodgkin’s lymphoma would be compensable illnesses in Vietnam veterans. These two diseases were included in the bill that was before Congress. Earlier that day, I had been interviewed on the Today Show about the Agent Orange bill, so this was great news. I went to that press conference and did several media interviews expressing our gratitude for the Secretary’s actions. I knew that the person behind that VA change was Anthony “Tony” Principi, the VA Deputy Secretary. Principi was a Vietnam veteran who had been Counsel to the Senate Veterans’ Affairs Committee. We had worked with him on a regular basis. Several days later, Principi called and asked if VVA would back off its advocacy for the Agent Orange legislation, considering VA’s recent action. I explained that while we had faith that he would be an advocate for continuing to look at the effects of Agent Orange and communicating that to the Secretary, we could not count on the next administration carrying through with that concern. I always felt the most important part of the legislation was the ongoing study of Agent Orange effects that was mandated in the bill. Besides that, I told him, our members have been working on this for more than ten years. We needed legislation to ensure this issue did not die. Principi understood our position and, in future hearings, VA tended to talk about what it had done, including the registry, but did not try to debunk our positions. In 1990, H.R.565 was going to get a hearing in the House Veterans’ Affairs Committee Healthcare Subcommittee, chaired by Rep. Douglas Applegate (D-Ohio). For the first time we knew we had enough votes in that subcommittee to get it approved and sent to the full committee. Paul Egan and I met with Rep. Applegate and other members of the subcommittee before the hearing to make sure they understood the scope of the legislation. But at the subcommittee hearing, a most unusual thing happened: Chairman Montgomery and Committee Minority Leader Bob Stumpf (R-Ariz.) attended the hearing and, as the ranking members who had voting rights on all subcommittees, voted against the bill. We lost the vote. Rep. Applegate was angry at this unprecedented interference with his subcommittee. We met with him again to determine if there was anything that could be done. Applegate decided to threaten to withhold his support of some legislation Montgomery favored if the Chairman refused to bring the Agent Orange legislation to the full committee. Reps. Lane Evans and Jim Jontz had the legislation attached to a fiscal bill coming before the committee. Montgomery relented, knowing we did not have enough votes to pass in the full committee, and scheduled the mark-up (a hearing in which pending legislation is voted on) for, surprisingly, October 12, the opening day of VVA’s 1990 National Leadership Conference, held in Reston, Virginia. We only had a few days’ notice but were able to identify the VVA members coming to the Conference from the districts of the House Veterans’ Affairs Committee members. We gathered those members and bused them to Capitol Hill the morning of the hearing. They went unannounced to their Representatives’ offices and said they were there to walk the members to the Veterans Affairs’ Committee hearing and expected them to vote in favor of the Agent Orange legislation. I was not able to go to the hearing because I had to open the Leadership Conference, but those who went explained how many committee members looked apologetically at Montgomery as they voted for the amendment, which passed by a vote of 16-14. Montgomery’s admonition that “all politics is local” played out as representatives would not vote against the bill with their constituents sitting in the hearing room. Sen. Daschle and Rep. Evans came to that Leadership Conference to speak at lunch that very day. They were ecstatic with the win for which they—along with VVA—had worked so hard. On January 17, 1991, Rep. Montgomery introduced the bill in the full House, saying he did not think the NAS would find any increased risk from dioxin exposure but that he needed to get this controversial issue resolved so the committee could move on to other pressing issues. The bill passed unanimously on January 29. The next day, the Senate also passed the bill unanimously. On February 6 President Bush, in an unexpected White House ceremony, signed the Agent Orange Act and, ironically, handed the first signing pen to Sonny Montgomery, praising him for his advocacy for veterans. The VA followed through with its responsibility to work with NAS to set up the processes for the review of scientific studies and the VA’s determination of compensable illnesses. While the VA did not keep track of the number of veterans compensated for Agent Orange-related illnesses under the Agent Orange Act until 2002, between 2002 and 2013 more than 650,000 veterans and their survivors received compensation under the provisions of the Act. It took many years and many people to gain this justice for our generation of veterans, but the work goes on as VVA stands, as always, in the forefront of the continuing fight for understanding this devastating issue. Mary Stout served two terms as National President of Vietnam Veterans of America, from 1987-91, and as a U.S. Army nurse with the Second Surgical Hospital in An Khe and Chu Lai, 1966-67.